* What is mold and should I be concerned? * Why is mold growing in my home/building? * How can I prevent Mold growth? * Can Mold be toxic? * What is Black Mold? * Why are we concerned about Mold? * How do Molds affect people? * Who is affected by exposure to Mold? * What should I do if I see or smell Mold in my house/building? * Should I test my building/house for Mold? * Who do I call to deal with extensive Mold growth in a building? * Can I remediate the problem myself? *Should I test for VOCs? *Will the lab reports be understandable? *How long will the on-premises test take? *What do I need to do with regard to test preparation? *Can your test tell me where the off gassing is coming from? *Who is affected by VOCs? * Will ozone kill odors, spores, bacteria and viruses? * How does Ozone work? *What is the process of Ozone treatment in my home or building? What is Mold and should I be concerned? Why is Mold growing in my home/building? It is important to stress that mold spores are everywhere, on all surfaces. 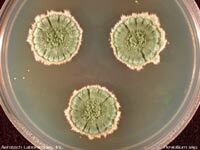 When the factors are right, they will grow and form colonies. Add moisture and nutrients and mold will grow. Different types of mold will grow in a variety of conditions. Most likely there is a moisture source in your building that needs to be remedied. Sometimes the building structure was wet during construction. Moisture intrusion (from swamp coolers) may push the building envelope over the 60% mark. Mold spores will grow and propagate (multiply) on a variety of surfaces when moisture requirements are met. Common sources of indoor moisture that can cause mold problems include flooding, roof and plumbing leaks, damp basement or crawl spaces, or anywhere moist air condenses on cold surfaces. 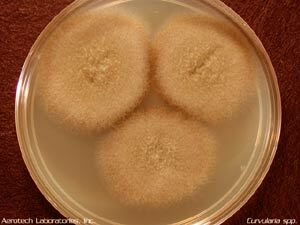 Some molds can produce toxic substances called mycotoxins. Airborne mycotoxins have not been shown to cause health problems to occupants in residential or commercial buildings. The health effects of breathing mycotoxins are not well understood and are currently under study. High or chronic airborne exposures, typically associated with certain occupations like agricultural work, have been associated with illnesses, although these are rare. More is known about eating mycotoxins (from humans and animals consuming moldy foods or feed) and the resulting health effects than is known about breathing mycotoxins. Why are we concerned about Mold? Small amounts of mold growth in workplaces or homes (such as mildew on a shower curtain) or workplaces are not a major concern, but no mold should be permitted to grow and multiply indoors. When molds are present in large quantities, they may cause nuisance odors and health problems for some people. Mold can damage building materials, finishes and home furnishings. Some molds can cause structural damage to wood. Those with special health concerns should consult their doctor if they are concerned about mold exposure. The symptoms that may seem to occur from mold exposure can also be due to other causes such as bacterial or viral infections, or other allergies. What should I do if I see or smell mold in my home? Probably not. It should not be your first step. Your first step should be to inspect your home for any evidence of water damage and any visible mold growth. Testing for mold is expensive, and you should have a clear reason for doing so. In most cases, it is not economically practical or useful to test for mold growth on surfaces or for airborne spores in the home. Testing also tells you little about where mold is located and how to clean it up. In addition, there are no standards for 'acceptable' levels of mold in buildings, so when testing is done, it is usually to compare the levels and types of mold spores found inside the home with those found outside the home. If you know you have a mold problem, it is more important to spend time and resources to get rid of the mold and solve the moisture problem causing the moldy conditions rather than to test for the mold problem. Who do I call to deal with extensive mold growth in a building? Can I remediate the mold myself? 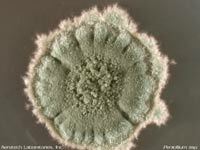 Spores from dried mold are very dangerous and should be cleaned with caution. You should never scrape or scratch at dried mold as the spores would then be released into the air and pose an inhalation risk. A respiratory mask and eye protection are necessary and adequate clothing to prevent skin contact is recommended. If the problem is more internal such as on insulation or throughout a carpet, the only solution is to remove and replace the items. An infested area of over 2 feet is considered a "heavily infested" area and professional help should be consulted. Mold problems resulting from flooding should also be managed professionally to avoid possible health risks. VOC stands for volatile organic compound. MVOC stands for mold volatile organic compound. VOC is a chemical compound and is best thought of as off gassing particles from paints, varnishes, glues, perfumes, household cleaning agents, etc. All buildings and furnishings off gas their chemical components. Think of a new car smell or a library smell or that of a freshly painted room. MVOC is an indication of mold colony off gassing. 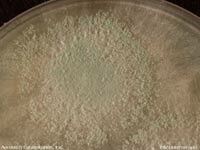 Often used in conjunction with a mold ambient air test for airborne spores or surface samples, this test can provide additional confirmation of the presence of mold. Should I test for VOCs? It depends. If you think there may be something amiss with the indoor air in your building, then perhaps it will affirm your suspicion. Typically, homeowners or office dwellers cannot identify the source of their concern. The testing equipment used by Prism Analytical is highly sensitive and measures to the nanogram (one billionth of a gram). As always, sometimes the absence of elevated VOCs is as instructive as the presence, giving you assurance that your home or office is not an issue. Will the lab reports be understandable? In my opinion they are, but I am familiar with them. I always provide a written report synopsizing the results. Any questions or clarification needed is welcomed. Feel free to call. More information and sample reports. How long will the on-premises test take? Two hours for the VOC/MVOC. Twenty minutes for the formaldehyde. What do I need to do with regard to test preparation? I will go over the protocol with you before the test. Essentially we do not want the building 'aired out' before the test as we do not want any VOCs diluted with fresh air. Heavy cooking or frying or house cleaning is also discouraged so we can obtain accurate results. Can your test tell me where the off gassing is coming from? No, not specifically. But the report is ingenious as it will link certain compounds with certain products. From there you can deduce what may be the culprit. Who is affected by VOCs? It is more an issue of sensitivity to VOCs rather than being affected by them, and sensitivity can manifest differently among individuals. We can all be adversely affected by a chemical if there is undue exposure. Certain exposure guidelines are included in the VOC/MVOC reports. In the report you will be able to gauge what is 'normal' or acceptable. $495 for the initial test, then $395 for each additional test. Ozone is an oxygen molecule with an additional oxygen atom weakly attached to it and is produced naturally by lightning or when highly energetic solar radiation strikes oxygent in the atmosphere. Commercially, it is produced by coronal discharge or ultraviolet light generators. The O3 molecule is highly unstable as the extra oxygen easily transfers to organic matter and most metals (rust, corrosion). The process is widely referred to as oxidation. Ozone is known as a trace gas, meaning there is very little of it in the atmosphere. Ozone is safe in low doses, but at more than 100 parts per billion, ozone can be damaging to animal life by causing irritation to the mucus and respiratory tissues of animals, and even plants. For this reason, pleaole, plants and pets must be removed when treating an area. Exposure to high levels of ozone is uncomfortable, and anyone encountering it will have the same reatcion as to heavy chlorine bleach smell. Ozone is highly unstable, and a room saturated with it will return to normal air in about 30 minutes after the machine is stopped. The preferred method of ozone use is to use high levels for short periods of time. The operator uses a timer for machine shut down and then waits for the proper amount of time to elapse before re-entry. Should re-entry be required earlier, a full face respirator is highly recommended. The process is safe, but an educated operator is essential for smooth operation. Will Ozone kill odors, spores, bacteria and viruses? Yes, most definitely. Ozone has been a known gas since 1840. Years later (1906) in Nice, France, the first drinking water treatment plant was installed. Subsequent research into toxic gasses led to the use of chlorine, which is still preferred over Ozone for water treatment. However, the discovery of trihalomethanes (THM) as a harmful disinfection byproduct has led scientists to look for alternatives. Another problem was that micro-organisms (such as Cryptosporidium) develop resistance to disinfectants. Finally, there has been progress in the abolishment of shortcomings in ozone management. See www.lenntech.com/library/ozone/history/ozone-history.htm#ixzz29gmXcflE. How does Ozone kill odors, spores, bacteria and viruses? By the power of oxidation. We have all witnessed rotting or decaying plant or animal matter. This is the process of oxidation, where natural oxygen is used decomposition. The opposite process, absence of oxygen, led Napoleon's scientists to discover the process of canning food. Ozone kills bacteria, viruses and spores by destroying the outer membrance of the organism. Smells are oxidized in the same manner by rapidly accelerating their decomposition. What is the process of ozone shocking in my home or building? Foremost is the 3-P rule. No People, Pets or Plants inside the area being treated. If there is some concern over expensive paintings or electronics, they should either be removed or covered with plastic. The general rule for these last items is that short exposure will not harm them. We will always aim for high concentration of ozone with short time duration. The processing time varies according to the square footage of the building and also the degree of smell. Minor smells (noticeable, probably non-toxic, unpleasant at most, moderate cigarette smoke), medium smells (obvious and striking, unpleasant, not comforable to live in, mold, MVOCs) and extreme smells (potential health risk, impossible to be inside, extreme odor such as decay, vomit, urine, strong chemical smells, VOCs) all factor in with regard to time. The best method for ozone shocking is to saturate the space in as short of time as possible, so a 500sf space might take 2-3.5 hours, depending on how strong the smell is. 1500sf might take 3-5 hours. We need to let the ozone dissipate after that, usually about 30 minutes.